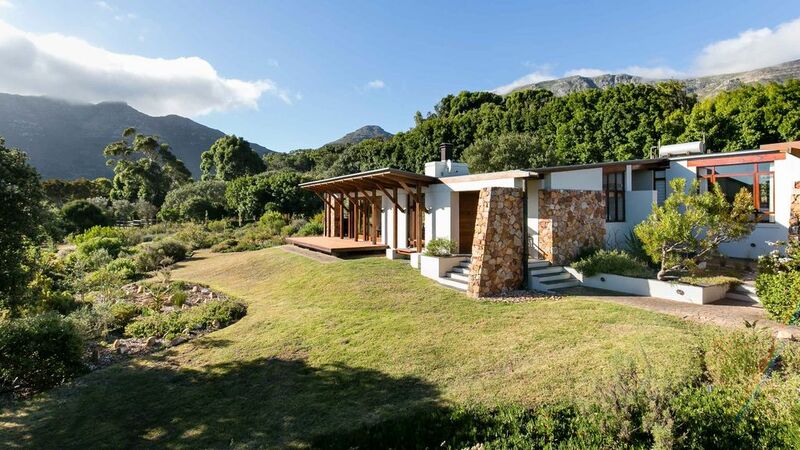 Kinghorns Garden is an exclusive vacation home in a rural ambiance at the foot of Chapmans Peak. You will find tranquility and relaxation in the 170 m² of living space and the 8200 m2 garden. It is almost like a botanical garden as you stroll between countless fynbos bushes and cape flowers and enjoy the view of the surrounding mountains of Champans Peak and the Silvermine Nature Reserve, as well as the 8 km long beach of Noordhoek. Everywhere you will find garden benches for sitting and watching and drinking the South-African wines. You can read in a hammock under shady trees by the fish pond or dine at the robust oak table. You can refresh yourself in the Jacuzzi on hot summer days. A hot shower under the African sky is an experience or serves as refreshment after the sauna. Near Kinghorns Garden you will find the Noordhoek Farm Village with their own 'arts-and-crafts shops' and delicious restaurants. Kinghorn's Garden has enough space for up to four people with two bedrooms. Both bedrooms have an en-suite bathroom with a shower or bathtub and a WC. After an eventful day, you can relax in the living room with a view of the Atlantic and the large garden. Sliding doors lead to the patio and the garden and always guarantee enough fresh air. During the South-African winter, you can spend cozy hours in front of the large fireplace. The kitchen is fully equipped and leaves little to be desired. You can cook on a gas stove, use the oven or microwave and there is of course a dishwasher. You can also enjoy the stunning view while cooking. We couldn't fault Kinghorn's Garden. The house is extremely well appointed, comfortable, bright, spacious and secure. The garden is a delight, teaming with wildlife, and with mesmerising views, especially as the sun goes down. Photographs do not do the property justice. The location is excellent, within striking distance of everywhere, and most particularly Noordhoek Farm Village and its excellent restaurants, shops and entertainment, which is within walking distance. Above all, would like to thank Antje, Ree and Andreas for thier helpfulness and responsiveness. We also loved Jessie and Toffee, the resident dogs, which often called to say hello! We have been coming to Cape Town and its surrounds for many years, and can honestly say that Kinghorn's Garden has been our best experience to date. The property is in a fantastic location with mountain views and very quiet. Walking distance to the Farmvillage coffee roasters, juice bar and the excellent Foodbarn. Lots of nice people in the area! Antje, the manager is gracious and available. The house is older, but very comfortable. The two large watchdogs are amazing and the Black rabbits so much fun to watch. The kitchen is too sparse, my only complaint. We really loved it and will be back! Spent 4 nights here beautiful place and gardens. The home has everything you need fully equipped kitchen ( well stocked with plates, bowls and glasses), gas bbq large decking to sit on to enjoy the afternoon sun. Sun lounger with cushion on decking and by the small pool/Jacuzzi. Felt like home and would love to return. guard gogs on site both Rottweiler friendly but can be intimidating if you are not a dog lover!! Thank you very much for your lovely and detailed review. We really appreciate that. You are absolutely right with the shower topic. We take your feedback seriously and have already planned to convert the bathroom accordingly during our winter. Jessie and Toffie, the two guard dogs are both Boerbulls. Boerbulls are known as an intelligent and energetic breed. They are loyal, great with children, and are very protective. They form an important part of the security of this property. We looking very much forward to welcoming you again at Kinghorn's Garden! This is a great place to stay! You have all the luxuries of 5 star but in the comfort of a warm home environment. We absolutely loved spending time by the pool and deck soaking in the natural beauty of the fynbos gardens and mountains that surround you. What a beautiful and peaceful retreat!! The pictures of Kinghorn's Garden are gorgeous and when you see them, you think the house and the gardens couldn't possibly be better in person. Well, they are. This property will take your breath away. The house is gorgeous, the gardens are spectacular, and the overall setting makes for a perfect holiday in Cape Town. Antje and Thomas are warm and responsive from the minute you make an inquiry. We especially appreciated Antje's advice about activities for families with young children. Kinghorn's Garden's location was absolutely perfect for us because we wanted to balance the beach with local restaurants, activities for kids, and the city of Cape Town itself. We could have eaten at the Farm Village every meal of every day, and what a joy to WALK to it from the house. The house itself had everything we needed and we were very, very sad to say goodbye after our stay there. We will come back next year and can't imagine staying anywhere else. Noordhoek - rightfully referred to as the green heart of the Cape peninsula - is especially treasured by equestrians and nature lovers. The city stretches itself from the slopes of the Silvermine Nature Reserve to the wetland, dunes and the 8km long beach and has a very rural ambiance with its countless horses and farms. Noordhoek offers a perfect infrastructure for your dream vacation with a large shopping mall, the Noordhoek Farm Village, numerous restaurants, possibilities to go horseback riding and all types of water sports, dolphin and whale observations (dependent upon the season) and countless hiking trails. Due to the central location in the heart of the Cape peninsula, you can get from Noordhoek to countless attractions in the Cape region, like, for example, Chapmans Peak Drive, the Cape of Good Hope, the penguins of Simonstown, the vineyards of Noordhoek and Constantia or one of the four surrounding golf courses. The tourist metropolis of Cape Town is only about 25 km away. Golf: The total Cape-region is a paradise for golfers and those who would like to be golfers. In the entire area of Noordhoek you will find almost 20 golf courses. About 10-15 minutes away from Noordhoek you will find the Clovelly Golf Course, the Simon's Town Golf Course, the Steenberg Golf Course and the Westlake Golf Course. Die Preise beziehen sich auf das komplette Haus bei einer Belegung mit zwei Personen und verstehen sich je Übernachtung. Für jede weitere Person ist ein Aufschlag von EUR 20 zu zahlen.